∫ Art in the Park Two — a display of work by local artists: Sir William Johnson Park, corner of Main and Market streets, Johnstown, 7 p.m.
∫ Kyle Hale — Forest to Home July exhibit: The Caroga Historical Museum, Caroga Lake, 7 to 9 p.m. The exhibit will run through Sunday. The museum is open from 1 to 4 p.m. Thursday through Sunday. Free admission — donations excepted. ∫ Charlene McNamara display: Frothingham Free Library, 28 W. Main St., Fonda. The work will be on display through Tuesday. ∫ Third annual New York State Summer art Show: Paul Nigra Center for Creative Arts, 2736 Route 30, Mayfield. Public can view the work from 9 a.m. to 6 p.m. Monday through Friday; and from 9 a.m. to noon Saturday. Gallery admission is $5; free to PNAC members and children under 18. The show will hang until Sept. 25. ∫ Annual auction: Broadalbin United Methodist Church, 65 N. Main St., Broadalbin, preview, 4 p.m.; auction, 6:30 p.m.
∫ Second annual Hot Rods for Kids car-truck-motorcycle show — Rough-n-Real Band: PM Auto, 1094 Route 30, Mayfield, noon to 3 p.m. $5 for adult admission; free for children ages 12 and under. ∫ Cosby Gibson: Gloversville Farmers Market, Elm Street Pavilion, Gloversville, 9 a.m. Free. ∫ Doc Orloff Duo: The Boathouse of Caroga Lake, 2090 Route 10, Caroga Lake, 3 p.m. No cover. ∫ Dominic Megna and Pet Jurgensen Duo: Lakeside Tavern and Marina, 306 Woods Hollow Road, Gloversville, 4 p.m. No cover. ∫ Free beginner lessons and dancing: Sharp Shooters Billards and Sports Pub, 35 E. Main St., Amsterdam, 6:30 to 7:30 p.m. New lessons and open dancing 7:30 to 10 p.m. $5 for those who stay or come in after 7:30 p.m. Sue Kaupelis, instructor. ∫ The Earth Tones concert: Gloversville Public Library, 34 W. Fulton St., Gloversville, 6:30 p.m. Free. ∫ Musical Instruments — children’s drop-in craft program: Gloversville Public Library, 34 W. Fulton St., Gloversville, 2 to 4 p.m. Boxes, tubes, rubberbands and other household items will be used in the craft. ∫ “The History of Music in Fulton County” audio-video presentation by Samantha Hall-Saladino, Fulton County historian: Gloversville Public Library, 34 W. Fulton St., Gloversville, 5:30 p.m.
∫ Miche Fambro — Johnstown Midsummer Concert Series: Charles Jenner Bandshell, West Main Street, Johnstown, 7 p.m. In case of rain, the show will take place inside St. John’s Episcopal Church, next to bandshell. 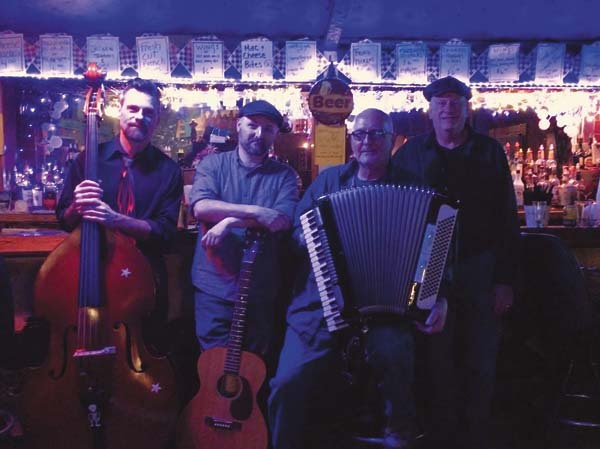 ∫ The Insolent Willies: Stump City Brewing, 521 W. Fulton St. Extension, Gloversville, 5 p.m.
∫ Johnstown Citizens Band — final concert: In the band shell, Johnstown — bring lawn chairs, 7 p.m. In case if inclement weather, the concert will move to St. John’s Episcopal Church next door to the band shell. ∫ Blind Crow: The Revival, 1441 Route 30, Wells, 7:30 p.m. $10 donation at the door; free for those 12 and younger. Refreshments. ∫ The Insolent Willies: Pine Lake Lodge, 1050 Route 10, Caroga Lake, 8 p.m.
∫ Fas4ward: Nick Stoner Inn and 19th hole, 1803 Route 10, Caroga Lake, 8 p.m.
∫ Ninny Michaels Band: Sport Island Pub and Restaurant, 108 Riverside Blvd., Northville, 9 p.m. $5 cover. ∫ Old Boys’ Network: Village marina, St. Johnsville, 6:30 to 8:30 p.m. Free to public. ∫ Gloversville Civic Band: Melchoir Park, Kingsboro Avenue, Gloversville, 7 p.m. Bring lawn chairs or blankets. Free concert. Rainsite, Lexington Center, 127 E. State St., Gloversville.